This page may be useful for golfers who are in the process of implementing Henny Bogan. The golf swing is a combination of the arm swing and the rotation of the body. When the arm swing is monitored, the motion is said to be hands-controlled-pivot. When the body rotation is monitored, the motion is said to be pivot-controlled-hands. In Henny Bogan, it is the pivot - the feet, hips and shoulders - that is monitored, not the hands. The motion should feel like the opening and closing of a door mounted on hinges along the left side of the body. Henny Bogan creates an automatic arm swing with the rotation of the body. Henny Bogan is assembled, loaded and fired with the rotation of the body alone. The arms are completely passive throughout the motion; they do not exert any active linear force. It is rotational force - torque - all the way. Power can only be increased by turning harder against the ground. Henny Bogan works only when the shoulder and hip turns have been completed to the respective limits in the backswing. This means that the hips have to rotate through two quarter turns and the shoulders have to rotate through four quarter turns. If the setup is correct and the motion is made in balance, there are only two errors that can occur in Henny Bogan. The first is the failure to take the rotation to its limit in the backswing. 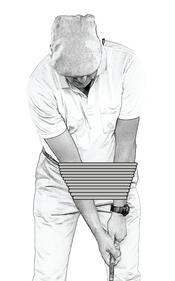 The second is the initiation of the forward swing with the shoulders instead of the hips. When the rotation is not taken to its limit in the backswing, the release will occur earlier in the forward swing and cause a push to the right. When the forward swing is initiated with the shoulders instead of the hips, the forward swing will be a retrace of the backswing and will cause a hook to the left. It is possible to use the Master's special geometry and make a hands-controlled-pivot motion. In such a motion, the forward swing will be a hitting motion of the right arm against a firm left side. But this runs counter to the Master's intended goal for Henny Bogan, notwithstanding his famous "Three Right Hands" statement (which has been explained in the book extract downloadable from 'The Book' page on this site). The correct feel is his two-handed basketball pass analogy which is a ground-leveraged shoulder turn and throw. Problems arise when an element of the hands-controlled-pivot motion is added into the pivot-controlled-hands motion. For example, the forward swing is initiated by the hips (a pivot-controlled-hands element) and this is followed by a hitting motion of the right arm (a hands-controlled-pivot element). In this particular example, the added arm action will cause a pull to the left. ​Ben Hogan's swing is the finest example of a Body Driven Swing (Pivot Controlled Hands). 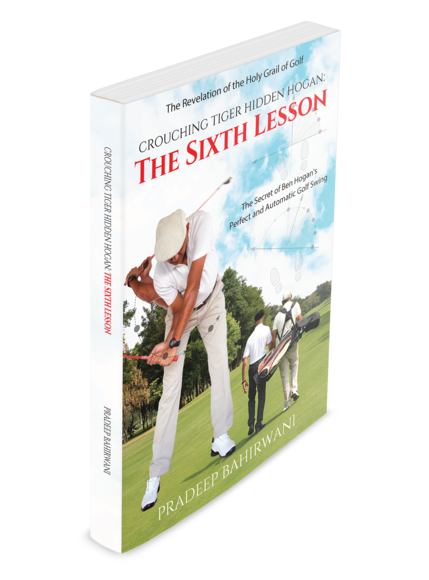 For a technical discussion on the Arms Driven Swing (Hands Controlled Pivot), please visit 'Crouching Tiger, Swinging Engineer' here. Henny Bogan creates an automatic arm swing with the rotation of the body. Henny Bogan is assembled, loaded and fired with the turn of the body alone. The arms are completely passive. This is the reason why the Master depicted the forearms as tied together in his book.